"Raise a game rooster to eleven months old.Kill and draw before the body cools. Cut the heart out and swallow whole as fast as it can be removed, blood and all, and if she don't choke to death she will be married in eleven months." Yeesh! I think I'd rather stay single! 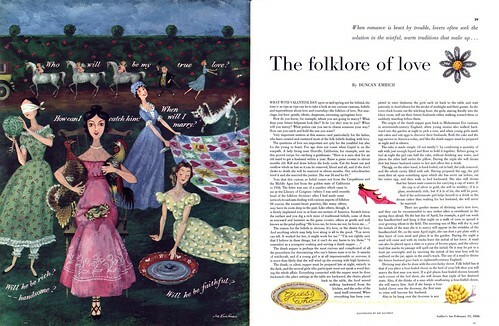 The editors at Collier's chose Joe Kaufman to illustrate this article on the folklore of love back in 1956. By then Kaufman had already exhibited his work at the Society of Illustrators (in 1945) and the Art Directors club (in '43). Kaufman is an author and illustrator of many children's books including Busy People, How We Grow, Work and Learn, About the Big Sky and others. Born in Bridgeport, Conn in 1911, a member of the Society of Illustrators and the Author's Guild, Kaufman resided in New York as of 2004, the last year in which I was able to locate information on him.